It’s hot and the sun is blazing sharp. Top temperature forecast – 33 degrees. I’m enjoying breakfast on the deck in the back garden. The vegetables are already watered for the day. The tomatoes are growing fast and the little snow peas are just getting moving, twining up their supports. A couple haven’t come on. I think I’ll pull them out. 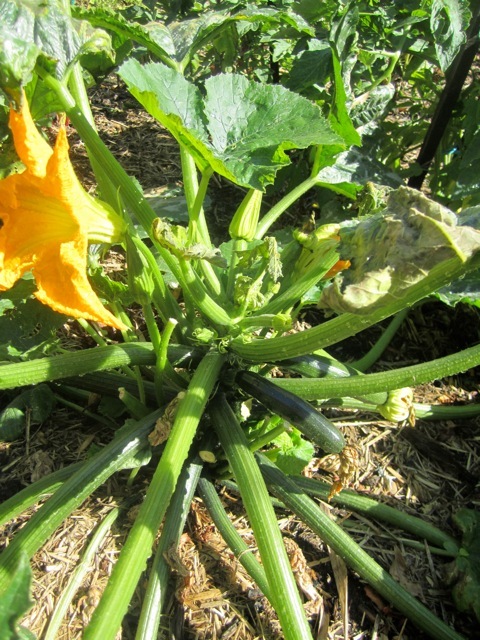 The zucchini got badly sunburnt last week on another hot, hot day and lost almost all its new leaves. But it’s recovering, and is jam-packed with little green cylinders. I must remember to pick them early. They’re so crunchy and delicious – and such a contrast to the rather soggy zucchinis for sale in the shops. If only I had the time, energy and skill to grow all my own vegetables! The coriander, planted small, mulched, fed and watered, is galloping to seed, like every other tray of coriander that I’ve ever put in. Why does it do this? What have I done wrong? The rhubarb is reaching for the sky. My long-established plants all cook up green. I’ve just put in a couple of scarlet-stemmed ones. Under the giant old olive tree beside the deck, Felix is toasting his tummy. 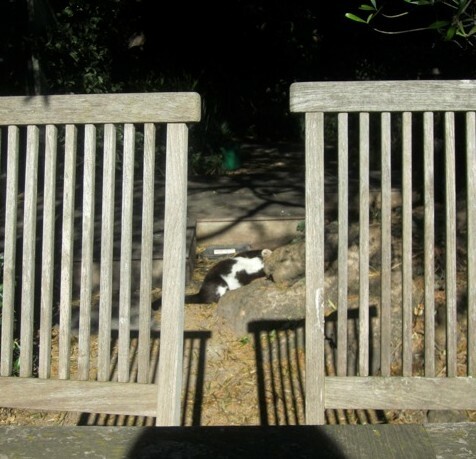 This black and white cat has been with us for nine years, not as long as the olive which experts tell us is more than a century old. The trunk is like a hoary old man, strong and solid with toes spreading into the earth. The new growth is surprisingly vigorous. The tree was a sea of tiny white flowers in spring. This year we’re going to have a bumper crop. Felix wriggles his back into the sandy gravel at its base, nestles his feet against one of the roots, leans his white throat towards the sun, twitches his tail and lets out a deep sigh. If there’s a more alluring sight than a pet making the most of a sunny morning, I have yet to see it. A honeyeater alights on the edge of the small birdbath. Takes a sip or two – and flips out of sight just as I reach for my camera. I think I’ll take its advice! What a magnificent specimen of old olive you have Anne. 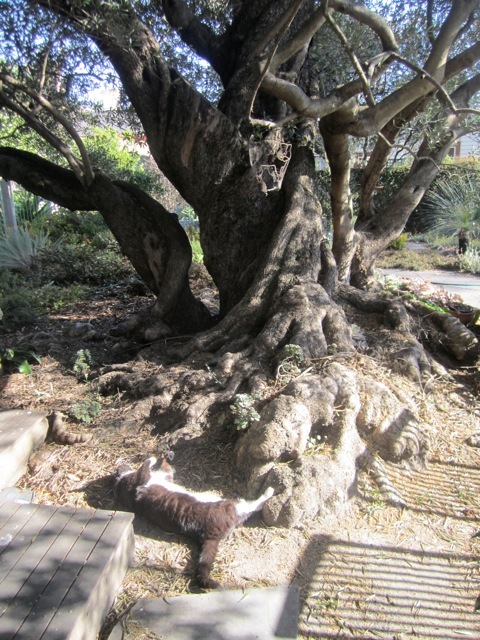 The gnarled trunks are just superb and so Mediterranean. And what a gorgeous sight is Felix with his white fluffy tummy at its base. As for your coriander, I only ever grow it in autumn for harvest through winter because I find that I cannot keep enough water up to it during the summer months. Thanks Alison. You are probably right and I will try coriander in the autumn. I try to water my vegetables every day, but don’t always succeed. By the way you should see the snow peas now. They are starting to flower and have doubled in size. I’ll have to go out and buy some long bamboo canes to make a tepee to hold them up! I hope your snow peas don’t succumb to the many plagues that afflicted mine. And I agree with Alison, it’s better to grow coriander through the cooler months to slow down its bolt to seed. 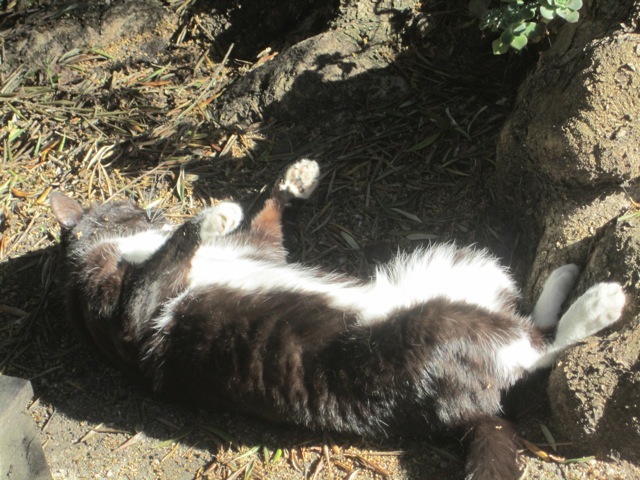 My cat also likes to roll on his back in the dirt – I thought maybe it was like ‘hair-wash day’ and he was using the dust to to degrease his fur. Such a funny behaviour for what’s otherwise a fastidiously clean animal. I finally grew Coriander very successfully during the cooler months in my shade house (or ‘cave’ as my 4 yr old grandson refers to it) and had an ongoing supply for ages. Likewise lettuces and other veg and herbs that I don’t have much success with all seemed to thrive in there. My chickens have dug a huge hole, enough to fit 2 chooks in, where they dust bathe every day, lining up to take turns – almost like being at the beauty salon! days, where temps soared to mid 30’s. We felt sure we had lost it when all leaves dropped, so we cut it back and this week the first signs of green are shooting through. I was so happy as it was a gift from my brother in law when he came from overseas to visit. The ups and downs of being a gardener. i can tell Felix is having a lovely time. There is nothing nicer than watching your cat, sun themselves. My cat Ms. Fluff loves to roll in the dirt of the alley way, she adores it especially after I have vacummed the house. Regarding the coriander, the warm temperatures cause it to bolt but I have heard there is one now that isn’t suppose to bolt during hot weather.